As a James Bond fan you might be aware that James Bond often uses UNIVERSAL EXPORTS as an employer when going undercover. This has appeared in many of the films during the years. But what all fans might not know is that this was not an idea from the screenwriters but an idea from Ian Fleming himself. The only only thing added is the S in the end. In the second James Bond novel LIVE AND LET DIE from 1954 James Bond calls M from New York after his first meeting with Mr Big. You're connected, caller,' said the Overseas operator. "Go ahead please. New York calling London." Bond heard the calm English voice. "Universal Export. Who's speaking, please?" "Can I speak to the Managing Director" Said Bond. This is his nephew James speaking from New York." "Just a moment, please." Bond could follow the call to Miss Moneypenny and see her press the switch on the intercom. "It's New York, Sir," she would say. "I think it's 007." "Put him through" M would say. 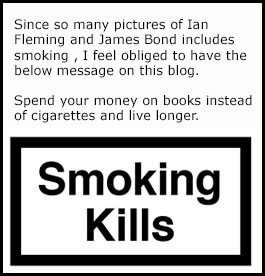 What I am trying to say with this post and actually whit this entire blog is that if you have not read the James Bond books you should. There is so much more with in the books and between films the books are an excellent way of enjoying the James Bond universe. To learn where all the ideas for the films come from. As Cubby Broccoli said. "When we get stuck with the scripts we always go back to the books..."